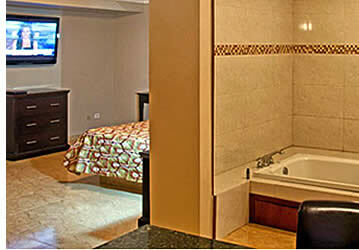 The nicest & most convenient mid-range lodging, all within the heart of El Cangrejo District! TRYP by Wyndham Panama Centro: 92 modern rooms fully equipped with the best technology to stay productive, fitness center and a rooftop pool and jacuzzi to sunbathe and chill. Magnolia Inn: renovated French style colonial mansion situated in Panama City's Old Town with 16 private rooms and 6 dorm rooms. 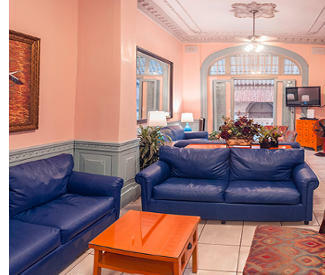 Hotel Milan: recently renovated hotel with different room configurations perfect for short term stays. Other mid range options to consider close to Habla Ya in Panama City: Novotel (6 minute walk), Sortis (10 minute walk), Eurostars (15 minute walk). 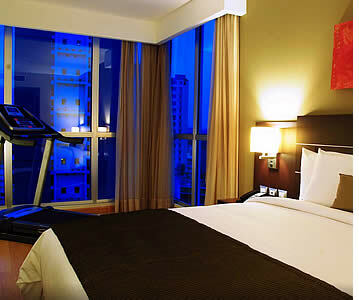 For a complete list of hotels in Panama City close to us click here. All of our lodging options in Panama City are in El Carmen, El Cangrejo, Obarrio, Marbella or the Financial District areas. This means that within a 10km radius you'll have access to hundreds of restaurants, shops, cafes, casinos and almost any other service that you might need. Most of our recommended lodging options are located within walking distance to our Spanish school in Panama City (1 to 35 minute walk, 5 - 10 minute taxi ride, or 1 metro (subway) stop away (5 minutes) and then a 5 - 10 minute walk). Only Habla Ya Spanish Students are eligible for the special rates for extended stays that appear on this page when they make their reservation through us. These special rates are offered to our students due to the amount of traffic that we generate for these hostels. 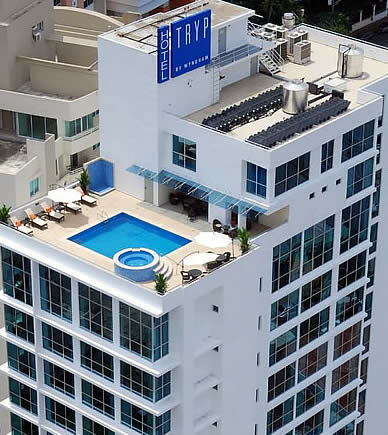 The TRYP Panama Centro offers you a brand new hotel with a very fresh feel built with attention to detail and a modern, clean and chic architecture. 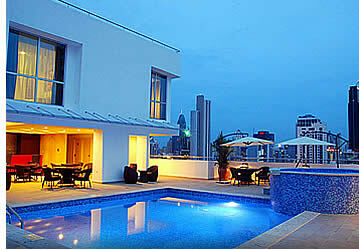 As confirmed by the hotel's many reviews, look forward to experiencing great customer service and modern comforts. We love its location within walking distance to 50+ of Panama City's most exciting restaurants, numerous bars, pubs, shops and casinos, but still with enough distance from the busiest part of Via Veneto where Panama City's nightlife is much more active. 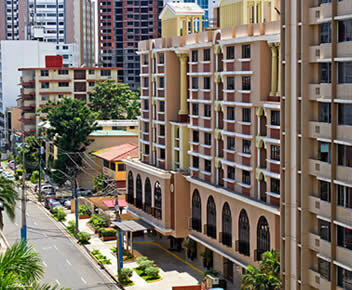 You can't beat the convenience of being only a 7 minute walk (550m) away from Iglesia del Carmen Metro (Subway) Station which puts you only 1 subway stop to our Spanish school and allows you to easily mobilize yourself to Albrook Mall and many other places in Panama City. It's also only a short drive to Casco Viejo, The Panama Canal, Multiplaza, Cinta Costera and the Causeway. There are different rooms to suit each guest's needs. The TRYP Deluxe rooms come either with a king sized bed or two full size beds. 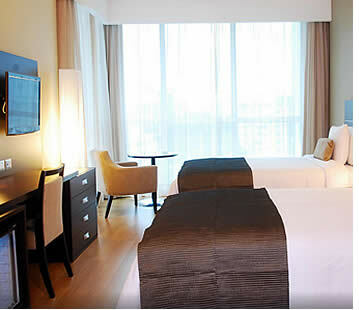 The Premium rooms, which besides having a king size bed also have a full size sofa bed. The Fitness Room provides a treadmill and exercise clothing, giving you flexibility to keep up with your daily fitness routine while you're on the go (the hotel also has a fitness center). The Family Suite has one king bed and two bunk beds and is large enough to allow the whole family to stay together. And finally the Executive Suite has a modern sitting room in addition to a king size bed and sleeper sofa. The philosophy behind TRYP Panama Centro leads their rooms to provide you with the best technology, including free high speed wifi as well as a wired Internet connection, allowing you to stay productive while you learn Spanish in Panama City. Its spacious rooms with an ample desk (except the Accessible TRYP room) and a comfortable working chair certainly make it very pleasant to do your Spanish homework at ease, catch up with emails, facebook or keep up with work back at home. Every room is air conditioned and comes with a hair dryer, coffee maker and mini fridge which always come in handy during an extended stay. What a better way to start your day with a fresh cup of coffee while you take in the view of Panama City's modern skyline. Other modern conveniences in every room include 32-inch LCD TV, digital safe and alarm clock with iPod dock (Premium rooms include an iron as well). TRYP Panama Centro's 92 guest rooms and suites abide to very strict standards which means your room will be exactly as promised, unlike other hotels where the quality and comfort of one room differs to the others. Let's start with the rooftop pool and jacuzzi: what a better way to spend the afternoon after an intense day of Spanish studies? Now, if you want to stay in shape, TRYP Panama Centro incorporates the most innovative contemporary fitness equipment as well as steam room and sauna. And why not meet up with friends at the hotel's very own The Gastro Bar at 507, a vibrant restaurant with a pinch of Mediterranean flavor open for breakfast, lunch and dinner. 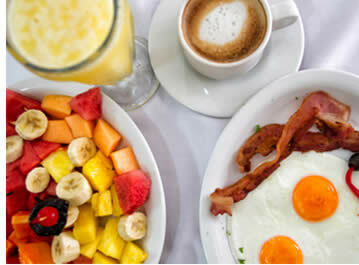 Premium Breakfast Buffet is also available at no additional cost and free parking is offered for all guests (not that you'll need a car with its convenient location). Thanks to Panama City's new subway system, you can now stay in areas that several years ago would have been a nightmare to commute from to Habla Ya Panama City, but are now easily accessible with an easy walk and subway ride. One of those areas is the historical Casco Viejo district. Home to an ever changing cultural, artistic, and social scene, with many galleries to stroll through, and great restaurants that will suit any taste or budget, you'll be able to experience a bygone era in this UNESCO World Heritage Site with some of the city's trendiest and most authentic bars and clubs. 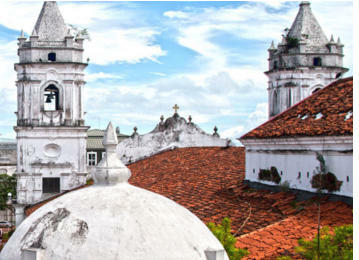 Take advantage of the fresh mornings before class to explore one of Casco's many must not miss attractions including the Presidential Palace, the Metropolitan Cathedral, historical plazas, the Inter-Oceanic Canal Museum, the National Theater, and plenty of others such as Las Bovedas, a colonial-era stone promenade, dungeon and seawall that stretches several blocks enclosing the neighborhood. Magnolia Inn has a comfortable common area and a sun dining room to relax and mingle with fellow travelers, as well as a fully stocked kitchen which is free to use for all the guests. 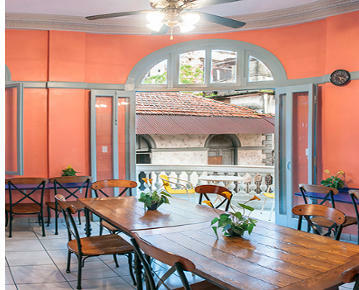 With 16 private rooms and a luxury hostel with 6 dorm rooms, Magnolia Inn showcases Casco Viejo's historical architecture while providing guests with modern comforts. Each private room has ceiling fans, air conditioning, in-room safes, hair dryer, orthopedic mattress with lovely linens, flat screen TVs with cable TV and spacious private bathrooms with hot water and wonderfully fluffy towels. The private rooms on the 2nd and 3rd floors have mini-refrigerators, coffee makers and electric kettles as well. Each Penthouse has a unique view, whether it's of Panama City's skyline, the Pacific Ocean, Taboga Island, Amador Causeway, ships entering the Canal's waterway, neighboring Casco or Ancon Hill. Each Penthouse has a king size bed and can accommodate a third guest (one in an additional twin bed while the other two have a futon / sofa as plus a seating area and desk). The Deluxe Private Rooms are perfect for visitors who want to want to enjoy the charm of Casco without spending a fortune. Two of these rooms have 2 queen beds while the other one has a queen and a twin bed (one of these rooms has its bathroom across the hall). The Mezanine Rooms (1st floor), recently renewed, are designed for single travelers and couples, and have one queen bed each. 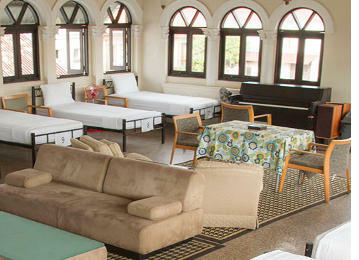 The Standard Private Rooms on the Ground Floor are suitable for the more budget minded visitors or families with children and come in different configurations, most of which have 1 double bed with the addition of either a twin bed, a sofa bed or a bunk bed, while the last room has 2 bunk beds. 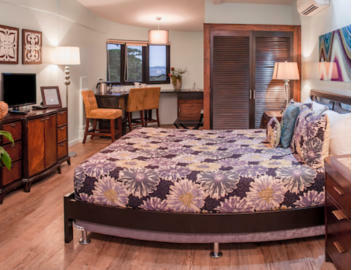 Magnolia Inn's Luxury Dormitories set the bar for budget accommodation in Casco Viejo and come with orthopedic mattresses, reading lights, electricity plugs and hot water showers. The dorms offer a superior level of comfort and cleanliness and were designed for the modern day global traveler. Dorm Rooms 1, 2, 3, 4 and 5 have air conditioning and ceiling fans, while the Ballroom (Dorm 6), with 12 beds, is for travelers who prefer to sleep with the windows open, each bed having its own floor mounted fan. This last room has 26 wonderful windows with two small balconies, its own living room area and a piano (players welcome). With a total of 38 dorm beds, dorms can also be booked as private rooms with their own private bathroom. If you're looking for a recently renovated hotel, with crisp and clean rooms, only a few minutes walk away from top rated restaurants and with some of the city's most popular pubs with artisanal beers just across the street, then you can't go wrong with Hotel Milan. Considering the hotel's rooms and location, right in the middle of El Cangrejo neighborhood, a short walk to Habla Ya Panama City and the subway, its rates are a real bargain, especially the long week stays offered to our Spanish students. We particularly love the Suites as they come with a mini fridge and hot tub. If you're only going to be in Panama City for a couple of weeks and don't need your own cooking space, then Hotel Milan is a great choice. The Hotel Milan, which opened in 2004, was recently renovated last year and expanded from 53 to 107 rooms: 68 Singles, 2 Single Kings (for which they don't accept reservations), 18 Doubles, 5 Double Kings, 11 Suites, and 3 Family Suites all appointed with beautiful Spanish tile. All rooms at Hotel Milan are air conditioned and have en suite bathrooms, with hot water showers and hair dryers. In each room you'll also be able to enjoy several amenities such as free Wi-Fi internet, flat-screen TV with Cable, direct dial phone, safe deposit box and a desk which comes quite in handy when doing your Spanish homework. 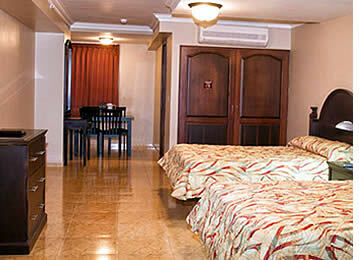 The Single Rooms have one full size bed to accommodate solo travelers or couples. If you're lucky enough when checking in, Hotel Milan might have a King Single available (additional cost) - they only have two of those. The Suites, which are the most suitable for our Spanish students, have a king size bed and are the only rooms that have a mini-fridge, which is extremely convenient for week long stays. 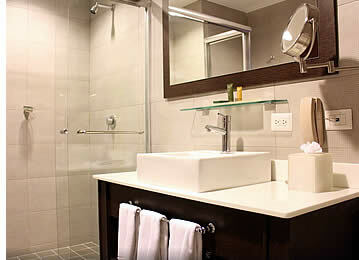 The Suites' bathrooms also have a bath tub with hot water, perfect to relax at the end of your day. If you're group is large, the Family Suites have two full size beds and one king, allowing you to accommodate up to six guests (three couples) in a room. Then come the Double Rooms which have two full beds to accommodate up to two couples. The Double King rooms are a little bit more ample than the Doubles, have two king size beds, as well as a small sitting area with table and chairs in addition to the work desk. Open daily from 7 a.m. to 11 p.m., the hotel's onsite restaurant has breakfast ranging from $4 to $10 per plate and plenty of fresh fruits to choose from. It also has a vast sandwich ($3 - $7) and lunch/dinner menu complete with all sorts of appetizers and drinks. Any meal from the menu can be take to your room for only $1. In the hotel's lobby you'll find the national newspapers delivered every morning and you'll have access to several desktop computers in case you need to quickly check your email or browse the web. Two floors of private parking are also available for guests. Wake up call service is also available upon request.